When it comes to children, you just never know what their little personalities are going to be like as they grow. As a mom of four children, I can say first hand that all four of them have very different personalities. Some personalities, of course, are more of a challenge than others are. When it comes to our oldest, who is 3.5 years old going on 13, her personality gives me a run for my money. She is the sweetest little girl at times, full of attitude and stubbornness, and is also extremely sensitive. As parents, my husband and I have really had to learn as she has grown up more, how to parent her and her sensitive nature. If your child gets really affected by sad movies, has an exceeding amount of empathy towards people or even animals that seem sad or down (after they have picked up on these emotions on their own), question everything and anything, or really try to make calculated decisions about things… you probably have a sensitive child like I do. It is hard for children to understand their feelings. They feel much more heightened emotions than adults and also recognize emotions in others much faster than others, probably due to the fact that children soak in so much of what is around them. Sensitive children have a harder time controlling their emotions usually because they are triggered much more easily than a child that isn’t as sensitive. I have seen this first hand with my very sensitive three-year-old in comparison to her sister, who just turned two, and has no where near the same level of sensitivity with her emotions. 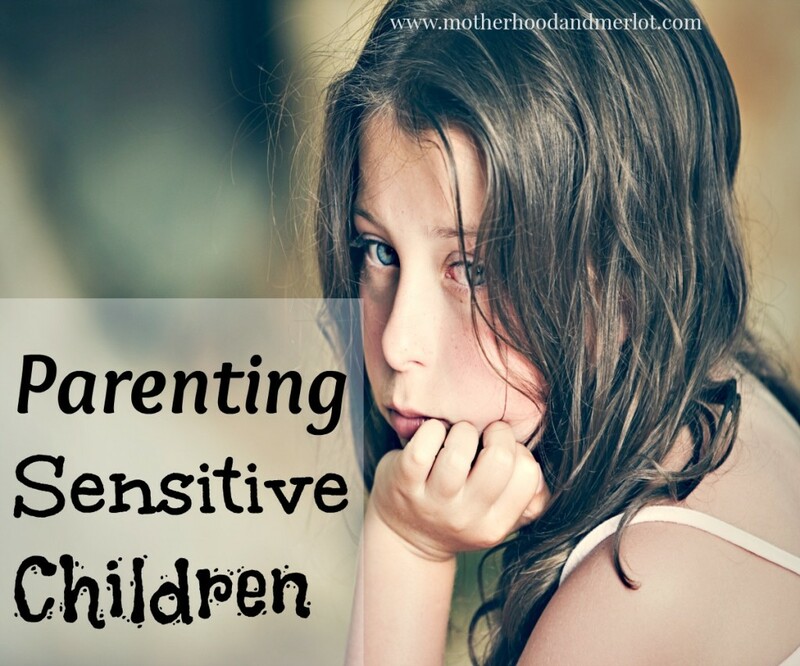 I say that this can be a tricky topic to maneuver because as parents, we can either coddle our sensitive child or we can give them the “toughen up” side. How do we figure out where the middle ground is so that we are not too much on either side? As parents to a sensitive child, it isn’t going to be very helpful to tell treat them like their emotions aren’t warranted or make them feel like they are being “a cry baby”. This is going to hurt their feelings even more and it may affect their self-confidence, which is already lacking if they are sensitive and always hard on themselves. We learned the hard way when my husband jokes around a little bit too much with our daughter about something that she gets very worked up about. He would tell her that he was going to put his sister in the cabinet if they didn’t behave (obviously a joke). She would get so upset and start hysterically crying about how much she loves her sister and how she doesn’t want him to do that. He used to laugh when she was overly sensitive about something so silly, but to her it wasn’t silly at all. The over sensitivity that our children experience are still very real emotions that they have to work through. We also cannot baby them and rescue them every time they have a melt down. I’m not saying that when they are upset we can’t comfort them, but we also can’t baby them and try to solve every little problem. Part of our job as parents is to help our children grow and learn. They cannot learn if they are always running to us to do everything, solve everything, and treat them like they cannot stand on their own two feet. Finding a happy median between these two sides is the first step to learning how to parent your sensitive child. The next involve making sure that you giving them ways to openly talk to you about their emotions, without immediately shutting them down or belittling their feelings. Communication is crucial when working with a sensitive child because they are perceiving and analyzing everything that you say to them. I make it a point to sit down with my daughter and listen to her “I feel” statements (her words, not mine… Thanks Daniel Tiger) and make sure that I was trying to really understand how she was feeling and why she felt that way. Even if we think they might be being overly sensitive, we still need to leave those lines of communication open and welcoming. My six year old is so sensitive. He will sometimes cry over seemingly trivial things. But, they are a big deal to him! My son is fairly sensitive, but he only talks about it with me and brushes it off when he is with my hubby… so I tend to be on the coddling side, since I know he tries to act ‘tough’ in front of everyone else. These are great tips! My son is sensitive so I try to get him to talk about his feelings. Thank you for sharing! I also have a 3 year old that is increasingly sensitive and it is very important for us to handle it carefully. We always want her to know that whatever she feels is ok and the most important this is to express herself and not keep it bottled up. Awesome job to you and your husband! Thank you:) We do our best! So very true… I have a sensitive child and we have had to learn different strategies with dealing with his behavior because of this. Parenting always seems to have those layers of learning, don’t you think? Thanks for stopping by! This is such an important topic. Your advice makes perfect sense and should be a help to others with sensitive children. I especially like your approach of the “I feel” statements. Thanks! My 4yo is so sensitive! We even avoid staying in large crowds for long periods because over stimulation drives her to the edge. She also does not like it when people laugh because of something she did. Thank you for the tips! There are definitely going to help! My daughter gets super shy if a ton of people are laughing at her, even if she was trying to funny on purpose! My teen is still sensitive. This trait takes a lot of patience, understanding & love. Theresa @DearCreatives recently posted…Top Five Must Have Tips To Love Your Lips & Wear Lipstick! YES! One of my boys is super sensitive and I feel like I react badly sometimes. He definitely needs a special kind of patience. Great post. We are still working through learning emotions with my oldest, but I can definitely see how having a sensitive child means different parenting.